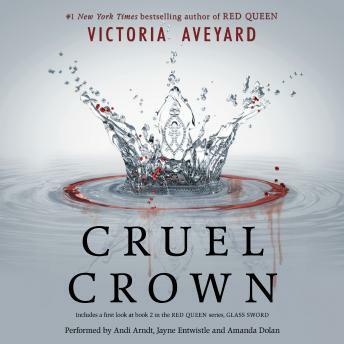 Discover the truth of Norta's bloody past in this collection of two novella-length prequels to #1 New York Times bestselling author Victoria Aveyard’s Red Queen series. Queen Song: Queen Coriane, first wife of King Tiberias, keeps a secret diary—how else can she ensure that no one at the palace will use her thoughts against her? Coriane recounts her heady courtship with the crown prince, the birth of a new prince, Cal, and the potentially deadly challenges that lay ahead for her in royal life. Steel Scars: Captain Farley exchanges coded transmissions with the resistance as she travels the land recruiting black market traders, smugglers, and extremists for her first attempt at an attack on the capital. She was raised to be strong, but planting the seeds of rebellion in Norta is a tougher job than expected—until she stumbles upon a connection that may prove to be the key to the entire operation: Mare Barrow. Loved hearing some of Coriann's story and how Farley met Shade. A thouroghly excellent trilogy!! Must read!! Be sure to read Red Queen first. You will understand this book on a much deeper level and gain more appreciation for each character. Listen to glass sword after! What a captivating trilogy. It's like reading Hunger Games. I'm not a fan of this book. Very disappointed with this purchase.